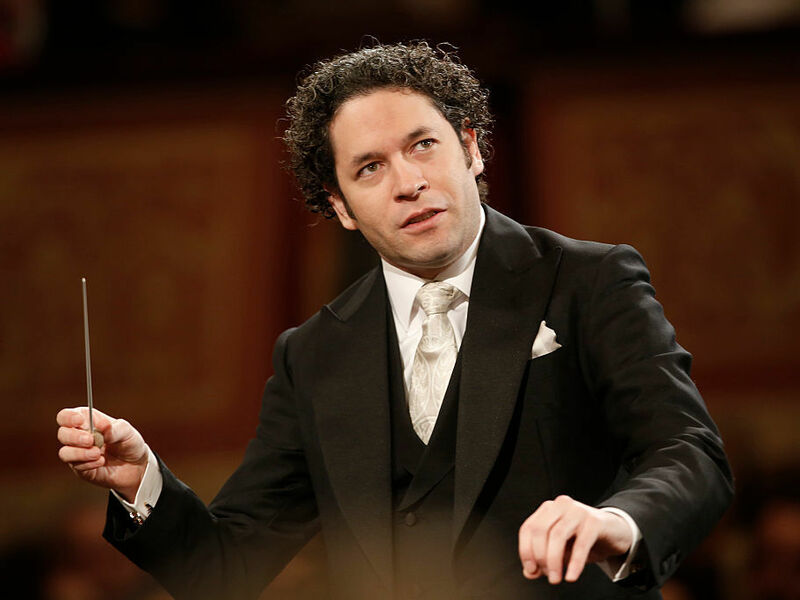 Gustavo Dudamel Addresses Venezuela's Leaders: 'Enough Is Enough' : Deceptive Cadence Long reticent to address the turmoil in his native country, conductor Gustavo Dudamel posted a lengthy open letter to the Venezuelan president and government today. Venezulean conductor Gustavo Dudamel, conducting in Vienna, Austria, in January 2017. "Nothing justifies bloodshed. We must stop ignoring the just cry of the people suffocated by an intolerable crisis," he writes, continuing: "I urgently call on the President of the Republic and the national government to rectify and listen to the voice of the Venezuelan people. Times cannot be defined by the blood of our people." Dudamel is intimately linked to Venezuela's renowned El Sistema music education program, first as a child beneficiary and later as one of its strongest champions and supporters. (The program is directly financed by the Venezuelan government, and serves as a point of enormous national pride.) Along with his work as music director of the Los Angeles Philharmonic, he is also the music director of the Simón Bolívar Symphony Orchestra of Venezuela, which was founded as the flagship orchestral program of El Sistema and has since expanded its mission. The conductor's statement comes a day after reports were published in Venezuela that a young man named Armando Cañizales — an El Sistema violist who hoped to study medicine — was killed in Caracas during a street protest, allegedly after being hit in the neck by a tear-gas bomb. Despite the economic and political turmoil in his native country, Dudamel for a lengthy time refrained from taking any public stances. In September 2015, he wrote an op-ed for the Los Angeles Times in which he asserted, "I am neither a politician nor an activist. Although I am aware that even something as benign as conducting an orchestra may have deep political ramifications, I will not publicly take a political position or align myself with one point of view or one party in Venezuela or in the United States .... Everything that I am and everything that I have achieved is a direct result of my participation in El Sistema and the steadfast mentoring of Maestro [El Sistema founder José Antonio] Abreu." Dudamel, who is 36 years old, has frequently been photographed with Venezuela's leaders, including the current president, Nicolás Maduro and its former president, the late Hugo Chávez. He also performed at Chávez' funeral in 2013. The conductor has been criticized at home and abroad for his reticence to speak out: In 2015, Venezuelan-American pianist Gabriela Montero — who played at former President Obama's inauguration in 2008 and who has been a voluble critic of the Venezuelan government — accused Dudamel, with whom she had often played in the past, as an "accomplice to a dictatorship." My entire life has been devoted to music and art as a way of transforming societies. I raise my voice against violence. I raise my voice against any form of repression. Nothing justifies bloodshed. We must stop ignoring the just cry of the people suffocated by an intolerable crisis. Extreme confrontation and polarization cannot seize common conscience and peace, constituting borders and barriers to understanding and peaceful and democratic coexistence. Historically the Venezuelans have been a fighting people but never a violent one. For democracy to be healthy there must be true respect and understanding. Democracy cannot be built to fit the needs of a particular government or otherwise it would cease to be a democracy. The democratic exercise involves listening to the voice of the majority as the ultimate bulwark of social truth. No ideology can go beyond the common good. Politics must be exercised from conscience and in the utmost respect of the Constitution, adapting itself to a young society that, like the Venezuelan, has the right to reinvent itself through the healthy and unobjectionable democratic checks and balances. Venezuelans are desperate for their inalienable right to well-being and the satisfaction of their basic needs. The only weapons that can be given to people are the necessary tools to forge their future: books, brushes, musical instruments; in short, those that embody the highest values of the human spirit: good, truth and beauty. I urgently call on the President of the Republic and the national government to rectify and listen to the voice of the Venezuelan people. Times cannot be defined by the blood of our people. We owe our youth a hopeful world, a country where we can walk freely in dissent, in respect, in tolerance, in dialogue and in which dreams have room to build the Venezuela we all yearn for. It is time to listen to the people: Enough is enough.